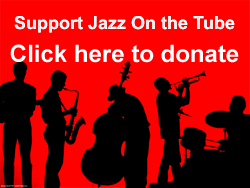 In addition to providing the largest curated collection of classic jazz videos online, we also maintain the biggest directory of jazz clubs, jazz festivals and jazz studies programs on the Internet. We’ve also started an audio podcast program. We also operate 30sJazz.com and ReallytheBlues.com and provide free technical services to 20sJazz.com. All free to you, but not free to us. Between hosting, e-mail management, extra bandwidth charges, data storage costs, research and editorial, clerical, programming and customer service, our monthly nut comes to $1,500 a month or nearly $18,000 a year. The ads we run help, but don’t cover the entire cost so if you’re inspired and able, we’re appreciative of any help you can send out way – as we are of all your support. P.S. There are two ways to contribute – both very appreciated: 1) a one-time donation or 2) a monthly subscription. Whatever you decide, even if you’re not able to contribute, we love you madly and we appreciate all your support!